Chapter 2: "Whenever I am about to publish a book...."
Flash is New York Public Library's artist-in-residence. As I understand it, OSU has got something like this. Eye Movements during a BBC4 Advert of a Library from VisCogEdinburgh on Vimeo. University of Edinburgh's Visual Cognition Lab has a really compelling way to visualize eye tracking. The concentric rings that you see on the ad are the results of the VisCog Lab's analysis. Another interesting analysis is the one done on on the Sony Bravia commercial below. This would be a great visualization for usability testing or eye tracking in live situations for wayfinding, etc. Eye Movements during an Advert for Sony Bravia from VisCogEdinburgh on Vimeo. DINFOS Academic Library from J.D. Harrington on Vimeo. This is a news story produced as a training tool at the Defense Information School at Fort Benjamin-Harrison, Indiana. The subject was the DINFOS Academic Libary, an on location facility that students used to gather information for their stories and relax for awhile. Film 26/52 - Shelf Stacking from Nathan Rae on Vimeo. Nice little write up. Amanda definitely deserves it. entire Free Library of Philadelphia system is set to close October 2nd." Ask a Librarian - 2009 PSA from Ask aLibrarian on Vimeo. Thumb-box exhibition, and weekly drawing classes. open seven days a week." OAL also sent out a request to its members to volunteer with their move over the Labor Day Weekend and to help transform their new space. To volunteer send an email to oal [at] oal [dot] org. Brad Schwede's project, Graffiti Technica, melds his love for the digital arts and the graffiti aesthetic. 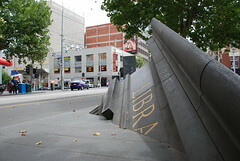 The image of Photek above is a digital representation of what the piece might look like if placed on the side of the state library in Brisbane, Australia. 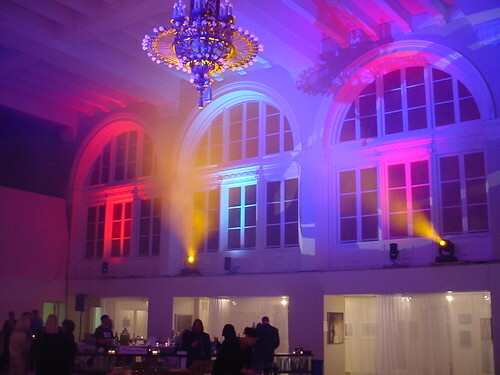 Below is a turntable rendering of Photek. 3d graffiti - 'Photek turntable render from Graffiti Technica on Vimeo.